Few regions of the world have seen more improvement in maritime security institutions over the last five years than the Gulf of Guinea. At the same time, however, maritime security threats across West and Central Africa have continued to evolve and are increasingly difficult to address. Ironically, the region is becoming a victim of its own success: improved maritime law enforcement drove criminals to become both more brazen and more innovative in how they pursue illicit profit. These heightened challenges, however, are no longer as insurmountable as even basic ones were a decade ago. Having built one of the most sophisticated and promising sets of maritime security architecture in the world, the Gulf of Guinea is actually well-placed to take on the new challenges it faces. To maximize the efficiency and effectiveness of this architecture in confronting these threats, a new element has to enter the conversation: technology. States, zones, regions, and the wider interregional mechanisms must all explore ways of leveraging technology to realize their respective mandates in the most cost effective way. Five years ago, discussing maritime technology would have been of limited value, as the state and cooperative mechanisms across West and Central Africa were too nascent to take advantage of it. Now, however, the Gulf of Guinea is primed to make better use of maritime security technology. 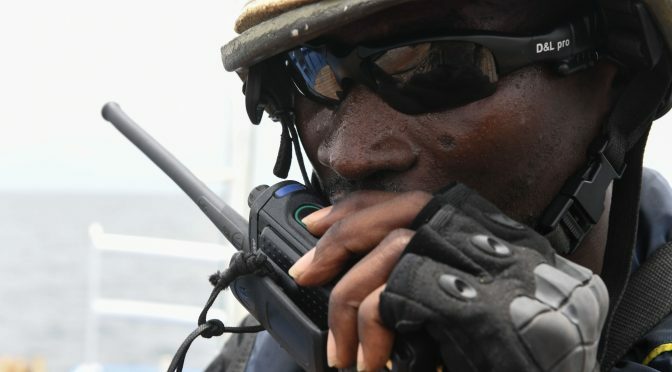 While progress in developing functional maritime security in the Gulf of Guinea may not have been as fast as some would prefer, it is now moving rapidly, and its trajectory is unmistakable. The signing of the 2013 Code of Conduct Concerning the Repression of Piracy, Armed Robbery against Ships, and Illicit Maritime Activity in West and Central Africa – known informally as the Yaoundé Code of Conduct – catalyzed an intensive process of national, zonal, regional, and interregional improvement that continues to gain momentum. As Article 2 of the Code states, “the Signatories intend to co-operate to the fullest possible extent in the repression of transnational organized crime in the maritime domain, maritime terrorism, IUU fishing, and other illegal activities at sea.” This initiative has given rise to a multi-tiered effort. At the national level, states are working to establish interagency processes for maritime governance, and to develop and implement national maritime strategies. States will remain the fundamental building blocks of maritime security in the Gulf of Guinea. Only through the national laws of the regional states can maritime crimes be effectively prosecuted. Beyond these national efforts, however, the states are engaging in an increasingly integrated, multilateral architecture that facilitates seamless cooperation. 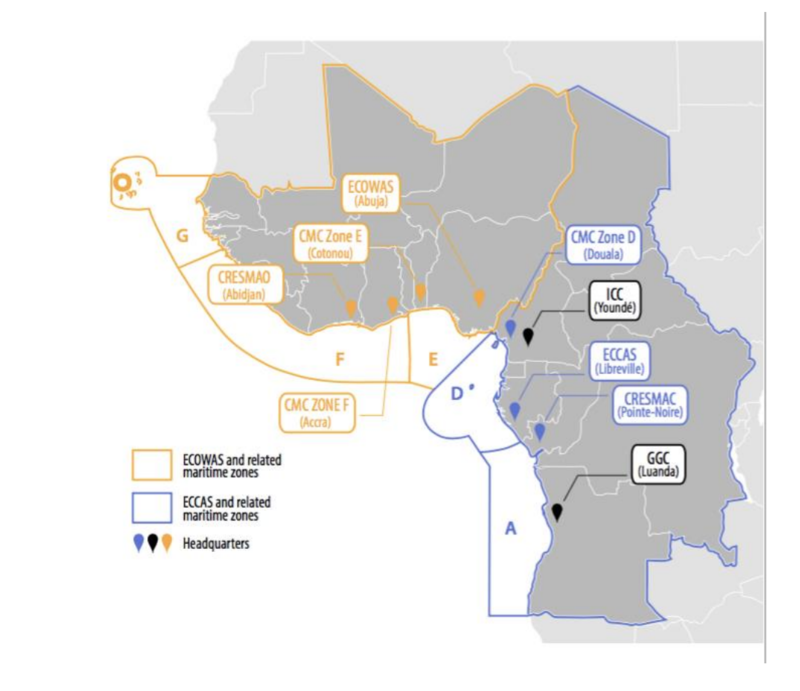 Each REC also has a corresponding Regional Coordination Center – CRESMAC for ECCAS based in Pointe Noir, Congo, and CRESMAO for ECOWAS based in Abidjan, Côte d’Ivoire. The two regional centers interact and share information with the MCCs to ensure operational cooperation across their respective areas of responsibility. At the apex of the architecture is the Inter-regional Coordination Center (CIC) in Yaoundé – the intersection of the operational, strategic, and political aspects of maritime safety and security in the Gulf of Guinea. CIC both coordinates and supports the work of the two regional centers, the five zones, and the 25 member states. At the same time, it has the important role of engaging both with international partners and national governments to build political will and ensure the Gulf of Guinea’s momentum continues. Importantly, the Yaoundé Architecture for Maritime Safety and Security (YAMSS), as the institutional framework is often called, is not merely a nice idea on paper; it is increasingly producing real results on the water. Furthermore, the community of maritime professionals involved in implementing this architectural design are increasingly connected with each other and working collectively to make maritime safety and security a reality in the Gulf of Guinea. As perhaps the most notable example, Zone D already serves as a leading example of how to conduct systematic combined operations at sea for maritime security, not just in Africa but around the world. CRESMAC and CRESMAO are becoming increasingly operational in sharing information across their regions and with each other. And CIC is beginning to garner the attention needed to be successful. At every level, there are encouraging signs of growing momentum and increased community among the maritime professionals in West and Central Africa. Most technology for maritime law enforcement is procured at the national level. Given the extent of the integration within the Yaoundé architecture, however, there is also an opportunity for technology to be procured at the zonal, regional or inter-regional levels to ensure harmonization, to streamline access to common, inherently interoperable systems and provide a uniform operating picture. Improving MDA has been a major focus for years in Africa. But there is a balance to strike: being aware of everything is almost as challenging as being aware of nothing. Efficiency and effectiveness therefore begin with how information is selected and packaged for use on and off the water. Operators from across different maritime agencies share a keen interest in technology that highlights useful, actionable information, and not only collects but also filters input, helping them focus on key areas of concern rather than providing blanket visibility of all maritime activity. Given the region’s limited human as well as financial resources, such technology could guide them toward confidently engaging in targeted interdiction. This holds true for maritime criminal activity as well as fisheries protection. But to be used consistently and effectively, the technology must be user-friendly as well. Simplicity is an important differentiator between technology that would improve general maritime domain awareness and technology that would actually help operations in law enforcement, fisheries protection, or search and rescue. For instance, artificial intelligence has now made it possible to have an MDA platform that not only shows ship positions and makes recent AIS anomalies visible, but also aggregates a wide range of real-time and historic data and filters them according to selected parameters, providing instant alerts to suspected illegal activity. That array of functions would allow for both launching decisive interdictions and detecting patterns of illicit activity. When any one state or even zone is perceived to be weaker than its neighbors, in terms of either its laws or its capacity for law enforcement, that state or zone becomes a magnet for criminality. Consequently, a major focus of the YAMSS is on harmonization to ensure consistency in deterring and addressing maritime crime throughout the Gulf of Guinea. Depending on how it is chosen, distributed and applied, technology could either exacerbate the problem or help resolve it. When one state has a significant technological advantage over its neighbors, the neighboring states are likely to suffer. Conversely, when shared technologies are deployed across neighboring zones and regions, new possibilities arise for communication, coordination, interoperability, and even harmonization of legal and regulatory frameworks. Some technologies, for example, could provide insight across the region as to where IUU fishing and illicit transshipment most frequently occur, or call attention to ships on erratic or otherwise suspicious courses. This could in turn inform legislative or regulatory action as well as operational decision-making at the national or zonal levels to help address maritime problems where they are most acute. Such an approach can therefore help CIC with building the political will to harmonize, as well as help the operators in their planning and execution of law enforcement activities. The more seamlessly technology is deployed across a region, the more difficult it becomes for criminals to find venues for illicit activity. As the name suggests, transnational crime is borderless; a common operating picture across the regions is therefore vital to identifying that illicit activity. Not only have the maritime institutions evolved in recent years, the available maritime technology has developed greatly. Surveillance systems to identify illicit activity on the water – from illegal fishing to illicit transshipment to trafficking and smuggling – have improved dramatically. Employing this technology means that operators are not merely patrolling on the off chance they encounter illicit activity. The confidence of law enforcement agencies that they will not be wasting fuel and other resources is greatly enhanced by engaging in targeted interdiction of vessels reasonably certain to be committing offenses based on real-time information. If law enforcement agencies can show that their efficiency is such that they have successful interdictions nearly every time they deploy assets, that success can become contagious. It can help energize the maritime agencies, deter criminal actors, and at the same time build the political will to ensure the longer-term safety and security of the maritime domain. Politicians are persuaded by success, and technology can greatly increase the odds of operational success. In addition to facilitating targeted interdiction, advanced surveillance technologies can offer a further benefit. Just as a robber could be arrested at home for a heist caught on closed caption television (CCTV), it is now possible for vessels to be arrested in port for illicit actions committed at sea and recorded using sophisticated maritime surveillance platforms. Though CCTV is not a possibility on the water, other technologies including the use of the vessels’ Automated Information System (AIS), Synthetic Aperture Radar (SAR), and Electro Optical Imaging (EO) can produce high degrees of certainty regarding illicit activity. While states must ensure that their rules of evidence allow for such electronic and digital data to be used in court, this leveraging of historic surveillance data is another way the technology available today can greatly amplify the impact of limited maritime law enforcement resources. Technology that helps counter smuggling will inherently benefit two states simultaneously – the state that is losing the smuggled good, and the state that is losing the tax on the importation of that smuggled product. If implemented effectively, technology could disincentivize the smuggling of certain goods. One crucial example of this is fuel: the cost of doing business in illicit fuel could, with effective law enforcement, become higher than that of selling it legally, thereby making it an unattractive business proposition. A suite of technologies such as molecular marking, GPS tracking of shipments, digital documentation, and state-of-the-art metering, strategically implemented across the Gulf of Guinea, would alter the risk-reward calculus and help West and Central Africa eradicate most cross-border smuggling of fuel. These and related technologies could also appreciably mitigate other modalities of illicit trade, including counterfeit tobacco and pharmaceuticals. For states and multinational bodies working to secure and govern vast maritime spaces that seldom command the political attention they deserve, investments in technology have to bring returns that justify initial and ongoing expenditure. Technologies that enable more streamlined and cost-effective operations, that combat activities that lead to substantial economic losses, or that actively generate revenue in the form of taxes, fees or various kinds of penalties are preferable to those that run at ongoing cost. Countering IUU fishing, prosecuting environmental crimes, and combating fuel smuggling are three efforts that could hold precisely this kind of appeal. Acquiring new technology that can stem economic losses from depleted fisheries and degraded marine spaces, elicit substantial financial penalties for illegal fishing or environmental, dumping, recover revenues previously lost to fuel smuggling or prevent subsidies fraud may well find more support among decision-makers than procuring more patrol vessels that need to be crewed, fueled, and maintained. And when the technology begins to pay for itself and lead to more success on the water, investing in new patrol vessels that can amplify that success also begins to look more attractive. If the political classes can see financial return on investment as well as improved maritime safety, security, and sustainability, wider adoption of the technology becomes more likely. Furthermore, if the procurement approach does not put all the economic burden on the purchaser, but rather balances investment and return, the Gulf of Guinea states are more likely to proceed. 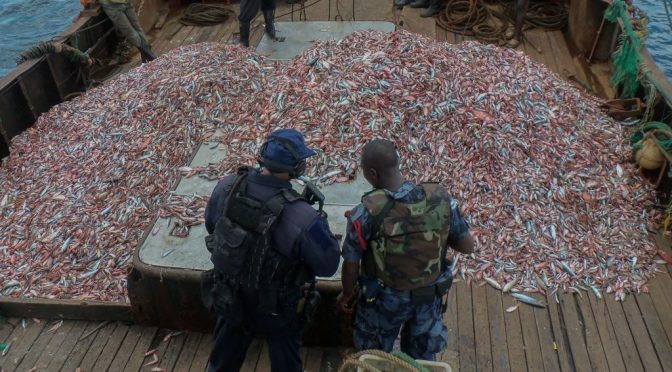 The Gulf of Guinea Code of Conduct not only laid the groundwork for an inter-regional security architecture, it also established IUU fishing as a crime coequal with piracy, trafficking, oil theft, and other illicit activities. This move made it possible to establish far more effective legal deterrents than the administrative penalties that often accompany fisheries-related crimes. It also allows for more sharing of technology and information across agencies that combat the full range of illicit maritime activities. In light of how such criminal enterprises as IUU fishing, trafficking, and oil theft often overlap, sharing technology in this fashion can close gaps in law enforcement that criminals have all too often exploited. Given that limited resources become even more limited when they are divided among multiple agencies trying to accomplish similar tasks, this sort of integration could have an immediate impact on maritime safety, fisheries protection and maritime security. Such sharing of resources, however, necessitates a functional interagency mechanism for maritime governance. Thus the state-level work on both whole-of-government approaches to maritime security and integrated maritime strategy development and implementation go hand-in-hand with the prospects for effective use of such technology. One of the most difficult challenges for the Gulf of Guinea, and indeed for any region, is translating operational successes into legal finish. If no prosecutorial or regulatory action is taken to penalize illicit activity, maritime law enforcement becomes a matter of catch and release. Technology can play an important role in assisting with maritime interdiction, but it also has an essential role to play in effectuating legal finish. That said, a challenge must first be overcome. Not all legal systems have provisions for technological, digital, or electronic evidence. In order to be able to use the evidence provided by the MDA and monitoring, control, and surveillance (MCS) technologies now emerging, the state’s evidentiary rules must be amended to ensure that technology can be used in court. If those evidentiary rules are more permissive, however, there is another possibility for assisting law enforcement. Traditionally, in the maritime space, perpetrators have to be caught in the act. But, as noted above, technology that provides evidence of illicit activity at sea could potentially be used to arrest vessels at the pier and on their return from a voyage that involved a breach of the law. In other words, limited vessels or a lack of fuel would not be a barrier to arrest and prosecution. Furthermore, regardless of where a vessel was caught, historical data could be used to increase the charges and penalties for prior offenses as indicated by the technology. The Gulf of Guinea is ready to more effectively use technology to enhance the work done to develop and operationalize the cooperative maritime security architecture in West and Central Africa. Cost-neutral or even revenue generating technology is most likely to garner the necessary political will, but from an operator’s standpoint, simplicity is also key. In addition to aiding targeted interdiction, technology can help provide the evidence for pier-side arrests and even enhance charges and penalties based on prior illicit activity. That said, legal systems must account for such technological evidence in court. Harmonized legal finish across the Gulf of Guinea must be a central focus, as that is the only way to change the risk-reward calculus and ensure that no state or zone becomes a magnet for crime. In a larger, more strategic sense, the individual states and regional bodies pursuing greater maritime security and development in the Gulf of Guinea must also work together to harmonize their more foundational approaches to the challenges facing the region. Too often stakeholders presented with the chance to cooperate or collaborate in confronting such issues fall into the trap of viewing that effort in terms of false dichotomies. They may rightly be keen to exercise autonomy in light of a history in which their sovereignty has been compromised. But they may also unhelpfully misinterpret the cooperative and collaborative harmonization of approaches as being a threat to sovereignty. In an effort to maintain their autonomy, they may therefore isolate themselves, and consequently become more of a magnet to the highly cooperative, transnational criminals they face. This diagram reveals how the terms of a dichotomy are never simply binary, but actually part of a cluster of related terms that are often conflated, or defined in varying ways.2 Failing to get outside the “box” formed by these choices can narrow vision and obstruct communication, and thus frustrate efforts at progress. The stakeholders in the Gulf of Guinea must clarify for themselves and each other the difference between exercising autonomy and isolating themselves, and between cooperating or collaborating and losing sovereignty. If everyone can achieve this “outside-the-box” clarity, progress can happen quickly and effectively. While many of the maritime operators recognize these nuanced dynamics, they have a challenge to overcome in convincing their political leadership to move past a limiting dichotomy centered on autonomy, and instead embrace cooperation and recognize the value in sharing resources and technology to secure, govern, and develop the maritime space in the Gulf of Guinea. The work of maritime professionals in West and Central Africa to pursue safety, security, and sustainability in the maritime domain has already led to some notable successes. Now it is in a position to begin realizing the ambitious vision of successfully securing, governing, and developing the region’s maritime domain. This is where new, better, and more effectively used technology can play a pivotal role by enabling individual states and regional bodies to make far more effective use of their resources to control the maritime space. Stakeholders must now select the right tools for the job – those that provide the necessary precision, simplicity of use, cost-effectiveness, and ability to link efforts across both agencies and maritime boundaries. Ian Ralby is a recognized expert in maritime law and security, serving as Adjunct Professor of Maritime Law and Security at the US Department of Defense’s Africa Center for Strategic Studies; a Maritime Crime Expert for UNODC; and as CEO of I.R. Consilium, a family business that works matters of security, governance and development. David Soud is Head of Research and Analysis at I.R. Consilium and works on issues at the intersection of fisheries governance and transnational organized crime. Rohini Ralby is Managing Director of I.R. Consilium and works on strategy development and implementation. 1. A recent public-private conference organized by the US firm I.R. Consilium, LLC in Freetown, Sierra Leone explored this topic and served as the basis for the key points of this article. 2. The diagram is an example of the “fourchotomy,” a strategic tool devised by Rohini Ralby. Technology adoption moves in fits and starts. The developing world cannot be forced into accepting new technology, but it can be enabled, and often in a surprising manner. A recent example is the leap in communications technology. During the 20th Century most of the world developed a robust network of terrestrial-based telecommunications based primarily on the ubiquitous land-line telephone system. Without this infrastructure in place Sub-Saharan African countries were largely left behind at the start of the information revolution. But at the turn of the new century something interesting happened. Rather than retroactively building an archaic phone system Africans embraced mobile phone technology. From 1999 through 2004 the number of mobile subscribers in Africa eclipsed those of other continents, increasing at a rate of 58 percent annually. Asia, the second fastest area of saturation, grew at only 34 percent during that time. The explosive growth of mobile phones and more recently smart phones across practically every African city and village has liberated economies and facilitated the free flow of information. This technology also enabled Africans to lead the world in mobile money payment solutions, bypassing increasingly obsolete banking systems. Today, Africans have another opportunity to leap ahead in technology to protect one of their most important areas of commerce – their coastal seas. Africa’s maritime economy is absolutely critical to the continent’s growth and prosperity during the next few decades. On the edge of the Eastern Atlantic the Gulf of Guinea is bordered by eight West African nations, and is an extremely important economic driver. More than 450 million Africans derive commercial benefit from this body of water. The region contains 50.4 billion barrels of proven petroleum reserves and has produced up to 5.5 million barrels of oil per day. Additionally, over 90 percent of foreign imports and exports cross the Gulf of Guinea making it the region’s key connector to the global economy. Favorable demographics and industrious populations put coastal Africans in a position to prosper, but an increase in illegal fishing activities and piracy since the early 2000s has severely impeded this potential. The growth in acts of piracy and armed robbery at sea in the Gulf of Guinea from 2000 onward points to the challenges faced by West African states. According to Quartz Africa, illegal fishing activities in the region have a negative economic impact of $2-3 billion annually. “Fish stocks are not restricted to national boundaries, and that is why the solutions to end the overfishing of West Africa’s waters can only come from joint efforts between the countries of the region,” Ahmed Diame, Greenpeace’s Africa Oceans campaigner, said in a statement. Marine pollution, human, and narcotics trafficking are also major issues facing the region. Due to the economic impact of illicit activities in and around West Africa a Summit of the Gulf of Guinea heads of state and government was held in 2013 in Yaoundé, Cameroon. This resulted in the adoption of the Yaoundé Declaration on Gulf of Guinea Security. Two key resolutions contained in the Declaration were the creation of an inter-regional Coordination Centre on Maritime Safety and Security for Central and West Africa, headquartered in Yaoundé, and the implementation of a new Code of Conduct Concerning the Prevention and Repression of Piracy, Armed Robbery Against Ships, and Illegal Maritime Activities in West and Central Africa. Adoption of this agreement has laid the foundation for critical information sharing and resource cooperation that can be used to combat piracy, illegal fishing, and other illicit activities in the Gulf of Guinea. Though the Code of Conduct established an architecture for maritime security in the region, without enforcement on the water, diplomatic efforts are largely impotent. Key to enforcement is the ability to identify, track, and prosecute nefarious actors on the high seas and in coastal areas. So-called maritime domain awareness is gradually improving in the area, but current options for maritime surveillance are limited. The largest local navies have offshore patrol vessels capable of multi-day over-the-horizon operations, but even these vessels have limited enforcement capacity. 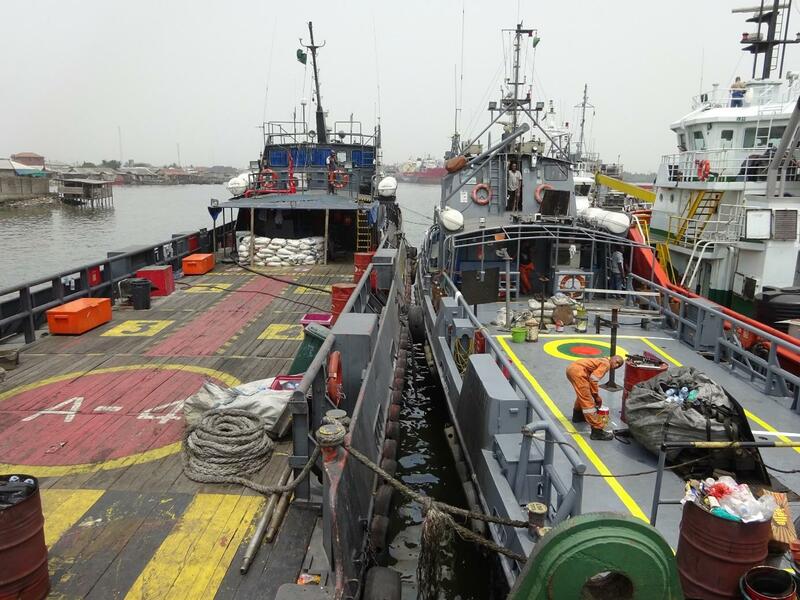 Patrol vessels face maintenance issues and fuel scarcity. Shore-based radar systems at best reach out 30 or 40 nautical miles, but are plagued by power and maintenance issues. Moreover, a shore-based radar, even with signals correlated from vessels transmitting on the Automatic Identification System, only provides knowledge that a contact is afloat, not necessarily any evidence to illicit actions. Latin American navies face similar maritime challenges to those in Africa and have learned that airborne surveillance is simply the best way to locate, track, identify, and classify surface maritime targets involved in illicit or illegal activity. A retired senior naval officer from the region related a study in the Caribbean narcotics transit zone to one of the authors that compared different surveillance mechanisms for the 11,000 square nautical mile area. The probability of detecting a surface target within six hours rose from only five percent with a surface asset to 95 percent when maritime patrol aircraft were included. Only a handful of coastal African countries have fixed-wing maritime patrol aircraft and helicopters, but these aircraft face similar issues to surface assets with fuel costs and mechanical readiness resulting in limited flight time on station. Unmanned aerial systems (UAS), or drones, as they are known colloquially, provide a way for African navies and coast guards to greatly enhance maritime security in a relatively inexpensive manner, similar to the ways mobile telephony revolutionized communications on the continent. Similar to the evolution of computing power outlined by Moore’s law tactical UAS are rapidly growing in capabilities while decreasing in cost. Improvements in sensors, endurance, and payload are advancing quickly. For any solution, acquisition cost, maintainability, and infrastructure required are key factors to be considered. The cost per flying hour of most UAS is negligible compared to their manned counterparts. Today’s fixed and rotary-wing systems, whether specifically designed for military use or for commercial applications, can be adapted for surveillance in a maritime environment without much additional cost. Because each country has unique requirements and budgets no single UAS solution is appropriate. Maritime drones can be based ashore or on coastal patrol vessels. One viable option for countries with limited resources involves services contracted by Western Partners, a model which has already been proven in the region for other applications. Alternatively, the Yaoundé Code of Conduct provides a framework for a possible shared model. This agreement can provide the timely sharing of critical information ascertained by maritime surveillance and reconnaissance systems to aid in the enforcement of the maritime laws and agreements in the region. Contractor-operated drones could be allocated across countries by leadership in the five Zones delineated by the Code. Multinational cooperation on maritime security has already been tested in the annual Obangame Express exercise and during real-world counterpiracy operations. Understanding that not all countries have the investment capability to purchase their own stand-alone systems, consideration could be given to sharing the initial investment costs between countries. The logistics of system placement and asset availability would have to be determined by the participating countries themselves but the benefit of such a program would positively impact the entire region economically, enhance interoperability, and assist in regional stability. Drones are already being operated across Africa by Africans. 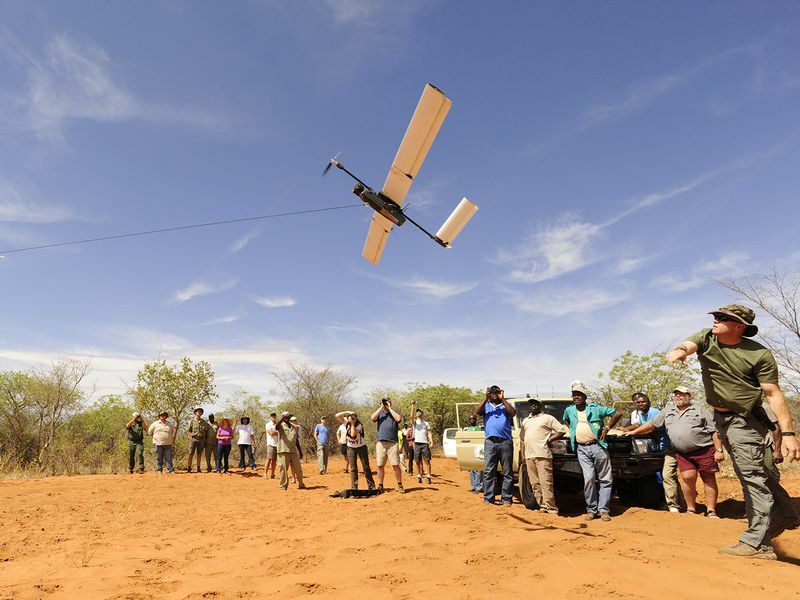 Zambia recently purchased Hermes 450 unmanned aerial vehicles for counter-poaching operations. There are also African unmanned systems flying surveillance missions over areas plagued by violent extremists groups. UAS are even being used to transport blood and medical supplies across the continent’s vast rural landscapes. Shifting these assets over water is a natural progression. One concern about using UAS is airspace deconfliction. However, this problem is minimized because there is little to no civil aviation in most parts of Africa. Additionally, most maritime UAS would be flying primarily at low altitudes over water from coastal bases. The leap-ahead capabilities that unmanned surveillance aircraft could provide to coastal security around Africa are clearly evident. African navies with adequate resources should make acquisition of unmanned air systems a priority. Likewise, western foreign military assistance programs should focus on providing contracted or organic unmanned aircraft capabilities. 2016 witnessed a marked increase in maritime security incidents over the previous year, irrespective of the counting standards. Denmark-based Risk Intelligence counted 119 verified attacks by criminals on all kinds of vessels in West Africa (Senegal to Angola) – compared with 82 in 2015. The vast majority of attacks in 2016 were perpetrated by Nigerian criminals, including all of the 84 that were concentrated in and around Nigerian waters. However, as alarming as such figures may seem, 2016 was neither unusually busy nor were there any significant changes to the patterns of maritime crime in West Africa, specifically the Gulf of Guinea, when assessed in the long term. Over a 9-year period (since 2007), the average number of maritime security incidents for West Africa is 122 – typically ranging between 80 and 140 per year. Of this figure, Nigerian waters alone account for an average of 87 attacks per year. Throughout this period, maritime kidnappings steadily increased and focused almost exclusively on Nigerian waters. Since 2013, maritime kidnappings have accounted for around 30 percent of all attacks (including failed attacks) off Nigeria. 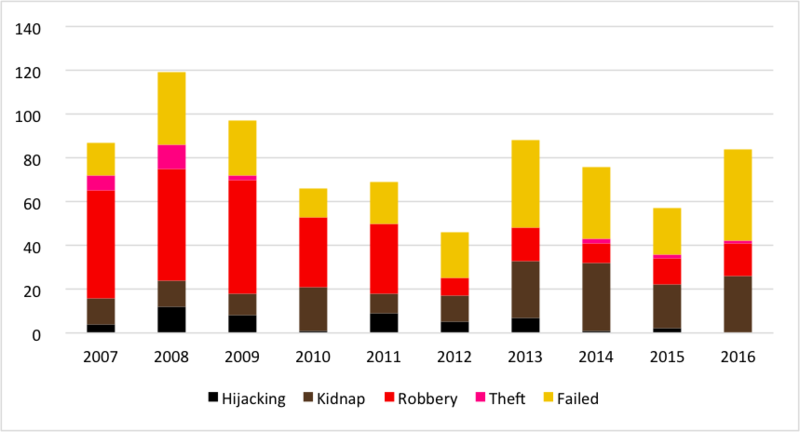 In 2016, most successful kidnappings were concentrated in two cycles of attacks: the first in January to mid-May 2016 (mirroring almost exactly the development of 2013), the second in the last two months of the year. Hijackings, a common feature during the MEND insurgency in the Niger Delta between 2006-2009, and again during the period of tanker hijackings between late 2010 and 2013, have all but stopped, following the successful intervention of the Nigerian Navy against the hijackers of the tanker MAXIMUS in February 2016. The real strategic concern for the Nigerian government in 2016 was the resurgent Niger Delta insurgency. It was spearheaded by a group called the “Niger Delta Avengers,” whose campaign of oil and gas infrastructure disruption reduced the Nigerian oil output to a historic low of 1.1m barrels per day (bpd) (vis-à-vis the projected 2.2-2.4m bbpd and the average 1.75m bbpd on average in 2015) during the summer of 2016. One impact on maritime security was the disruption of crude oil loading and an increased demand for petroleum products (due to Nigerian refineries being cut off from their crude oil supplies), thus creating, at least in theory, a more target-rich environment. However, the dynamics of maritime insecurity in Nigeria are historically driven by other factors. As the insurgency went through its customary cycles of issuing threats, militant action, and “cease-fires” to regroup and reiterate demands, the maritime security situation displayed an inverse correlation: the spate of attacks reminiscent of the first 4 months of 2013 swept across the seas off the Niger Delta between March and mid-May 2016, followed by a lull as militant groups were actively engaged in onshore violence throughout the summer. Offshore attacks returned to the waters outside the Niger Delta in November and December 2016 because of calmer weather, cyclical pre-Christmas criminal activity, and lower onshore militancy. This pattern suggests that at the tactical level, the “attackers” ,when not employed in militancy, oil theft, illegal bunkering or gang warfare, engage in piracy to cover some of their funding needs. The wider Gulf of Guinea was less affected by these developments than it was when the tanker hijackings originating from Nigeria peaked in 2011-12. While the capability to enforce security even in very limited parts of their territorial waters remains constrained for some nations, like Congo, Sao Tome and Principe, Liberia or Sierra Leone, organized piracy has not really taken hold in any of those places. In Guinea-Conakry, however, members of the armed forces are engaged in armed robbery at sea and extortion of foreign fishing vessels, even in neighboring Sierra Leone. Ghana experienced a spate of petty thefts at Takoradi anchorage, which gave it some bad press, but no violence against crews was reported. By and large, when speaking of “Gulf of Guinea piracy” as a problem for international shipping, it is Nigerian piracy that we mean. Other forms of maritime crime, on the other hand, such as illegal, unreported and unregulated fishing (IUU), smuggling of oil, drugs, agricultural products and other goods were – and are – the more pressing day-to-day challenges for coastal nations in the region. It is important to understand that many acts of Nigerian “piracy” also have a hidden context that the uncritical reporting in the international press is unaware of. Locally trading product tankers are often attacked, and crew members kidnapped or cargo stolen, as a part of criminal “turf” wars or other disputes between criminal parties. The kidnapping of crew members from fishing (and refrigerated cargo) vessels is often related to extortion within the criminal business of illegal fishing and transhipment of catch. This may, for example, have been the case on 27 November 2016, when the SARONIC BREEZE was attacked 80 nm off Cotonou. 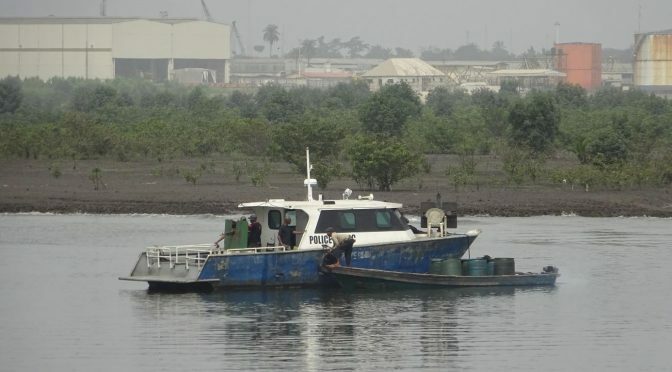 The Panama-flagged vessel, according to the Benin Navy, was in a different place than where it should have been (at the anchorage) when it was attacked and three crew members kidnapped. Against this slightly disconcerting backdrop, there is the gradual increase of political will and ability by some West African nations to take ownership of maritime security. 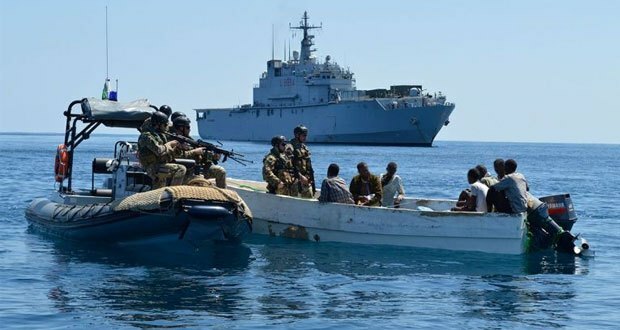 Following the successful rescue of the MAXIMUS, the Nigerian Navy launched Operation ‘Tsare Teku’ in the face of intense pirate activity, and prolonged the operation throughout summer, while being engaged in counterinsurgency operations at the same time. While the impact of the operation was assessed as modest even by Nigerian planners, it demonstrated that the Nigerians were, for the first time, publicly owning up to the problem of maritime piracy emanating from their country. 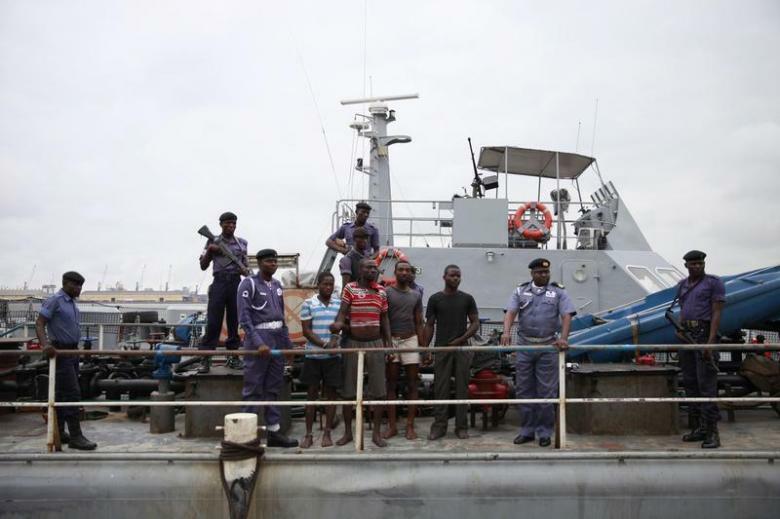 More recently, the flag officer commanding the Eastern Naval Command, Rear Adm. James Oluwole, quite rightly pointed out that the lack of prosecution reduced any effectiveness the Navy might have in the battle against maritime criminals. The lack of prosecution, and in many cases the lack of legislation that permits prosecution of pirates, is still one of the shortfalls of the implementation of the Yaoundé Code of Conduct as it came under review in mid-2016, when its initial three-year trial period ended. Information sharing, maritime domain awareness, and maritime law enforcement capacities and capabilities vary sharply throughout the region, and are by and large wholly insufficient, although measurable progress has been made in all fields. Nigeria, as the main country of origin for serious criminals in maritime piracy, is in the process of passing a law that will allow it to prosecute pirates who had hitherto gone unpunished or were indicted for lesser crimes. Gulf of Guinea states remain wary of private security solutions, yet various models of private-public security partnerships exist in the region. In Benin and Togo, both navies operate “secured anchorages,” in addition to providing embarked teams of navy troops through agents and local security companies. In Ghana and Cameroon, naval or, in the case of Cameroon’s Battalion d’Intervention Rapide (BIR), army protection can be obtained through direct liaison with those nations’ militaries. The most unusual arrangement though has evolved in Nigeria. Although various models have been employed by security companies and shipping companies, not always with authorization by the Nigerian government, the pre-eminent security solution is the security vessel or patrol boat. Security vessels have a long history that date back to the early 2000s, when the first armed unrest spread onto the creeks and off the Niger Delta. Typically, the security vessels of that era were ordinary offshore support vessels with four to six embarked soldiers. These vessels were (and still are) predictably ineffective against groups of heavily armed attackers, who engage with two to three large speedboats, often with one or two general purpose machine guns between them. The model of choice though, originally conceived at the height of the Niger Delta insurgency between 2006 and 2009, was for private companies to supply and maintain patrol boats, which would be put at the disposal of the then dysfunctional Nigerian Navy. When not on military business, those vessels and their Nigerian Navy gun crews with mounted weapons and ammunition would be available for protection missions for commercial clients. Sixteen Nigerian companies entered such an agreement with the Nigerian Navy in 2016 under a Memorandum of Understanding (MoU), effectively providing the bulk of offshore oil field security, and increasing the amount of merchant vessel protection in- and outbound from Nigerian ports. A privately operated joint venture also manages the secure anchorage off Lagos, the only such dedicated area in the region officially promulgated on admiralty charts. More than 100 such privately contracted security vessels are in operation in Nigerian waters. No one knows the exact number – not even the Nigerian Navy. The quality of these vessels varies – ranging from purpose-built law-enforcement and patrol boats to hastily converted offshore support vessels (or vessels with embarked troops only.) 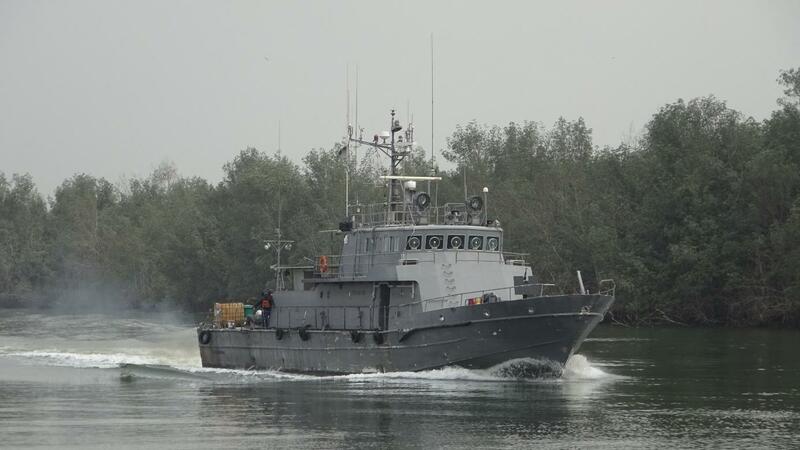 While this contractor fleet provides a welcome relief for the Nigerian Navy, which has only a few assets capable of patrolling the exclusive economic zone, it also presents a major headache for the Nigerian Navy’s operations department to monitor the activities of these contracted patrol boats and supply men, weapons, and ammunition to them and ensure compliance with the terms of the MoU. The document envisages a partnership between the Nigerian Navy and the private companies for maintenance, training, welfare, and information sharing, thus leveraging the Navy’s “investment” in terms of hard-to-get trained personnel and weapons into the public-private partnerships. Unfortunately, most companies appear to consider the partnership as an “optional” element of their relationship with the Navy. This is compounded by commercial and contractual pressures that preclude many security vessels from rendering assistance to attacks or incidents other than those involving their clients. Unless the MoU is enforced more rigorously, it is therefore unlikely that anyone except for a handful of commercial clients with sufficiently deep pockets will benefit from this arrangement. Despite the brief surges of offshore piracy in 2016, the Gulf of Guinea remains “business as usual” in terms of maritime security, with incidents in Nigerian waters or emanating from Nigeria accounting for the lion’s share of incidents. For the other West African countries, with a few exceptions, piracy is persistent, but one of the lesser problems in a region characterized by weak maritime governance. For Nigeria, 2016 was one of the hardest years since the county’s return to democracy in 1999, politically and economically. While the “Niger Delta Avengers” failed to incite a broad-based insurgency in the Niger Delta, their pinpoint targeting of critical oil and gas infrastructure in the Niger Delta was more effective than MEND ever was in that respect; even the temporary loss of control of considerable territory in the northeast to Boko Haram in 2013-14 was strategically less significant. The onshore security situation in the Niger Delta had a direct impact on the maritime security situation in Nigerian waters and the wider Gulf of Guinea. The seesaw between onshore violence and surges of offshore piracy underlines that while Buhari and his government have made some inroads against the “godfather” system, the latter is far from defeated. It continues to bind criminal, economic, and political interests in Nigeria together. Nigeria will thus remain the nexus for organized crime in western Africa and any regional efforts can only contain the maritime element of this threat until the problem is solved in Nigeria. Private maritime security will likely remain the (expensive) sticking plaster to fix the situation for commercial ship operators in the short term. However, few of the models in use, short of purpose-built and suitably armed patrol boats, are likely to provide any meaningful deterrent against Nigerian pirates in particular, who are both capable and willing to overcome armed resistance. Except for Ghana and Cameroon (where the use of naval/army assets for commercial purposes is severely circumscribed), none of the “private” or public-private maritime security solutions is likely to enhance the scarce maritime security assets and capabilities of the West African nations. Dirk Steffen is a Commander (senior grade) in the German Naval Reserve with 12 years of active service between 1988 and 2000. He took part in the African Partnership Station exercises OBANGAME EXPRESS 2014, 2015 and 2016 at sea and ashore for the boarding-team training and as a Liaison Naval Officer on the exercise staff. He is normally Director Maritime Security at Risk Intelligence (Denmark) when not on loan to the German Navy. He has been covering the Gulf of Guinea as a consultant and analyst since 2004. The opinions expressed in this article are his alone, and do not represent those of any German military or governmental institutions. Featured Image: A Nigerian Marine Police checkpoint on the Bonny River designed to intercept illegally refined petroleum products from being marketed in Port Harcourt. Endemic corruption in Nigeria’s police force casts some doubt on the effectiveness of such measures. Photo: Dirk Steffen. European Answers for African Questions? Maritime security challenges have received increasing attention in Europe in recent years. In 2014, the Council of the European Union adopted the first EU Maritime Security Strategy which includes a comprehensive definition of maritime security from a European standpoint. The EU understands it “as a state of affairs of the global maritime domain, in which international law and national law are enforced, freedom of navigation is guaranteed and citizens, infrastructure, transport, the environment and marine resources are protected.” In short, maritime security comprises much more than the traditional questions related to seapower and naval strategies. Furthermore, the document underlines the EU’s capacity to engage with other organizations such as the African Union which “has a direct impact on its ability to safeguard its interests and to strengthen regional and international maritime security.” Africa matters, not only because of migrants boarding rickety boats in Libya to embark on a dangerous trip to Europe. At the same time, European and African governments often have different agendas, underlined by the many challenges to maritime security emanating from the African coastline. Counter-piracy operations in the Indian Ocean are a perfect example of a maritime security challenge. When attacks by Somalia-based groups became a major worry for the shipping industry, the international community quickly reacted. The EU launched its ‘Operation Atalanta’ in 2008, complemented by other task forces from various NATO countries and other countries like Japan and China, who deployed independently of the task forces. The question of whether attacks by Somali pirates really justified the large-scale military response is open for debate. Nevertheless, European involvement in the fight against the perceived threat on one of the world’s busiest shipping routes underlined the importance of maritime trade routes for the continent. Almost without warning, European maritime security was suddenly threatened by men armed with AK-47s and RPGs in small skiffs rather than more traditional scenarios that military planners had always imagined. Capturing suspected pirates off the coast of Somalia. Image courtesy of the European Union Naval Force. Somalia, 2012. From a European perspective, the naval response to this non-traditional threat has been largely successful. Even though military officers and shipping industry representatives agree that the threat remains dormant and could resurface in the future, the number of attacks by Somali pirates dropped significantly within a short time. That success was made possible by unprecedented cooperation between naval forces and the shipping industry, as well as self-protection measures of merchant vessels, including the use of privately contracted armed security personnel. At the same time, the EU and other international organizations were heavily involved in capacity-building on land in Somalia. Failed integration of the RECs is arguably the most notable problem for the long-term sustainability of regional maritime security capacities. These organizations are the cornerstone for peace and security on the African continent. While ambitious plans for the African Peace and Security Architecture have not materialized yet, strengthening capacities within existing organisations would certainly be more sustainable than creating parallel structures in the context of counter-piracy operations. Somali piracy has never been high on the agenda of governments in East Africa. Attention for maritime topics in general remains limited but problems such as smuggling of drugs and weapons, the illegal wildlife trade or illegal, unreported, and unregulated (IUU) fishing are a much higher priority. In some countries, notably in Mozambique and Tanzania, security for the fledgling offshore gas industry is another important issue. European partners would be well-advised to take these priorities into consideration. West Africa is another region where piracy has been the most headline-grabbing maritime security problem in recent years.i From a European point of view, these attacks are less of a threat since they do not take place close to a major international shipping route. Nevertheless, the EU became involved, underlined by the ‘Strategy on the Gulf of Guinea’ and the ‘Gulf of Guinea Action Plan 2015-2020.’ Both documents highlight the EU’s strategic objectives in West Africa: a common understanding of threats, support for multi-agency institutions in the region, strengthened cooperation structures, and above all, the development of prosperous economies. Practical measures, however, have been extremely limited. In October 2016, the Gulf of Guinea Inter-regional Network (GoGIN) was launched, a four-year, €9.3m project supported by the EU and the government of Denmark. The aim of the project is the allocation of funds to regional or national endeavors to promote maritime security and combat piracy. Like CRIMGO, its predecessor project, GoGIN will be implemented by Expertise France, the French development agency. The agency undoubtedly possesses a lot of regional knowledge in West Africa but it is also a vital tool for the French government to secure political influence, particularly in francophone countries. Capacity building in West Africa does not have to include large-scale financial commitments by partners from Europe or elsewhere. Similar to East Africa, however, it requires a focus on regional priorities to be sustainable. 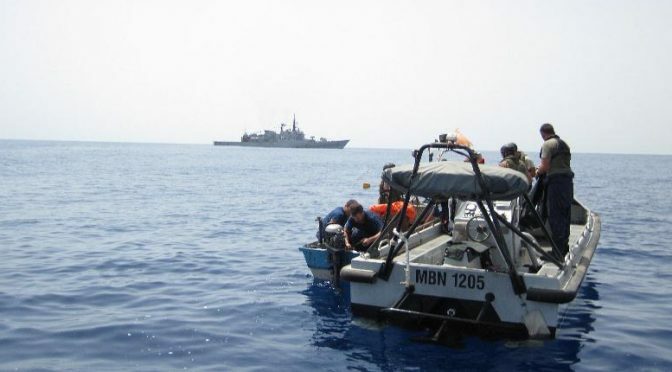 In the past, European involvement in the provision of maritime security in West Africa has largely been limited to the fight against piracy and armed robbery and, on a more limited scale, against drug smuggling on maritime routes. Similar to East Africa, however, the priorities of regional governments are notably different from those of the EU. For many countries in West Africa, illegal, unreported, and unregulated (IUU) fishing is the most important threat in the maritime environment, even though it is not a traditional security concern. Limited maritime situational awareness and almost non-existent law enforcement at sea are aspects that will not be changed overnight but even small-scale NGO projects have shown that improvements are possible even in the short term. European governments certainly have the necessary capacities to provide assistance, but political will is an entirely different question. Even in areas that are more closely related to traditional maritime security threats, European involvement in West Africa is generally not based on long-term planning. Training courses and other projects are rarely coordinated among partners, availability of relevant personnel is not taken into consideration, and overall goals are unlikely to be based on the priorities of partners in West Africa. Such criticism is mentioned time and again in conversations with naval officers and law enforcement officials from West Africa but does not seem to reach Europe. European maritime security may not be directly threatened by challenges off the African coastline, but they certainly have an influence on Europe. Addressing these challenges as early as possible would be important to prevent a possible escalation, yet that is true for security challenges in general. Due to the international nature of the maritime environment, however, a lack of security at sea is likely to have an impact on several countries, creating the need for multinational solutions. The European Union is in a unique position to strengthen maritime security, both at home and abroad. In theory, the combination of civilian and military measures is the perfect fit for a broad range of largely non-traditional maritime security challenges, ranging from piracy and armed robbery at sea to IUU fishing. In practice, however, the EU’s potential is often wasted by concentrating on areas that are important for European governments while failing to address the agendas of partnering governments. In West Africa, a similar document was already adopted in 2013 and the European Union has signaled its intention to support implementation. So far, however, that support has been sketchy at best, and one of the EU’s main goals, the development of prosperous economies around the Gulf of Guinea, remains elusive. Addressing maritime security challenges alone will not immediately lead to economic growth, but it would certainly be an important step. The focus on maritime security in the wider context of the ‘blue economy,’ however, is not a traditional task for navies in Europe and will require better coordination between a wide range of partners such as governments, NGOs, and law enforcement agencies outside the military. Dirk Siebels works as an analyst for Risk Intelligence. His research areas include maritime security issues in sub-Saharan Africa and he presents regularly at academic and military research institutions on related topics. Before starting to work in his current role, Dirk served as an officer in the German Navy and worked as a journalist and PR consultant for several years. He holds an MA in International Studies from Durham University and is currently working on a PhD in maritime security at the University of Greenwich. The views presented here are those of the author. i West Africa in this context includes all coastal and island nations between Senegal in the north and Angola in the south. These countries are members of ECOWAS or ECCAS, the two regional economic communities for West and Central Africa, and have adopted the Yaoundé Code of Conduct to strengthen maritime security in the region.